Smithfield, the world's biggest producer of factory-farmed pigs, has agreed to be taken over by Shuanghui, China's biggest pork producer. It's a match made in hell. Shuanghui has 13 factory farms that produce more than 2.7 million tons of meat each year. 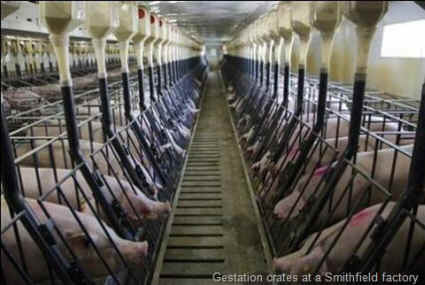 For $4.7 billion, it will take possession of Smithfield and its 460 facilities that raise 15.8 million hogs a year. Behind the deal is the fact that Chinese people are eating more meat than ever, and farmers and factories can barely keep up with the demand. They need all the pork they can get from other countries. 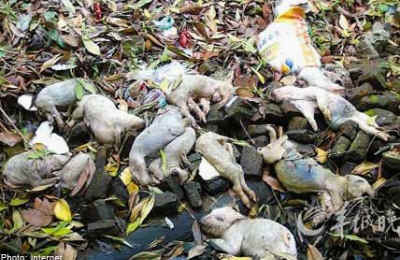 After all, their practices are so dreadful that, at last count just a few weeks ago, 16,000 dead pigs were seen floating down the Huangpu River that flows through the middle of Shanghai. Officials said most of them had come from factory farms upstream in Jiaxing, probably dumped by factory owners who were about to be caught red-handed selling diseased pigs to brokers and middlemen who can then sell them to poor people. And that's just one glimpse of the factory farm racket that is China today. The meat industry just cuts corners wherever they think they can get away with it, and everyone else ends up with poisoned pigs and unnatural disasters. (At the same time, thousands of dead ducks were found washing up from the Nanhe river. And people were just beginning to die from H79N bird flu. Not that a nice American company like Smithfield would do anything like that. On a continuum of pollutants, [the excrement] is probably closer to radioactive waste than to organic manure. ... Smithfield's holding ponds -- the company calls them lagoons cover as much as 120,000 square feet. The area around a single slaughterhouse can contain hundreds of lagoons, some of which run 30 feet deep. The liquid in them is not brown. The interactions between the bacteria and blood and afterbirths and stillborn piglets and urine and excrement and chemicals and drugs turn the lagoons pink. Even light rains can cause lagoons to overflow; major floods have transformed entire counties into pig-sh*t bayous. To alleviate swelling lagoons, workers sometimes pump the sh*t out of them and spray the waste on surrounding fields, which results in what the industry daintily refers to as "overapplication." This can turn hundreds of acres - thousands of football fields into shallow mud puddles of pig sh*t. Tree branches drip with pig sh*t.
Some pig-farm lagoons have polyethylene liners, which can be punctured by rocks in the ground, allowing sh*t to seep beneath the liners and spread and ferment. Gases from the fermentation can inflate the liner like a hot-air balloon and rise in an expanding, accelerating bubble, forcing thousands of tons of feces out of the lagoon in all directions. Over four years in North Carolina alone, Tietz writes, Smithfield spilled 2 million gallons of excrement into the Cape Fear River, 1.5 million into the Persimmon River, and a million into the Trent River. What does the business world think of that? Fortune magazine's 2013 list of Most Admired Companies ranks Smithfield second among food production companies. The magazine asked executives at the world’s biggest companies to rank their peers in nine areas, from investment value to social responsibility. Hard to imagine what the companies further down the list are like. And there have been numerous reports, over the years, of scandals related to poisons found in pet food and other human foods. Understandably, many experts are concerned that Shuanghui plans to sell its poisoned food products to the United States. The company says it only wants to import pigs, not export them. Still, that's not altogether encouraging to the people around Smithfield's "lagoons" in states like Utah. 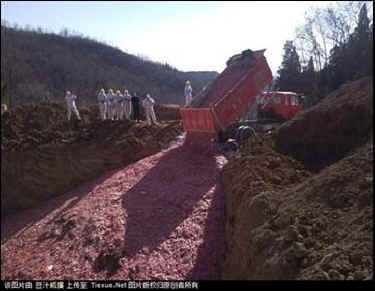 China gets the dead pigs; Utah keeps the toxic waste. And don't be sure that dead Chinese pigs won't be floating across the Pacific to the U.S. "They’re already trying to send their chicken products over here," Stanley Painter, chairman of the National Joint Council of Food Inspection Local Unions, which represents federal inspectors, told the New York Times. "So I’m of the opinion this is going to get their foot in the door, letting them claim, We’re an American-based company now, and so why would you try to block us?" The U.S. government has yet to approve the deal, and its careful review will explore the business angles, the health aspects, and the general benefit to the American public. Business people, health officials, politicians and diplomats will all weigh in. One stakeholder will have no say in the matter: the pigs. Winston Churchill is famous for saying: "A dog looks up to you. A cat looks down on you. Only a pig treats you as an equal." Sadly, we do not accord pigs the same regard. These intelligent, sensitive animals spend much of their lives in so-called gestation crates so small they can't even turn around or lie down. As a result of investigations by groups like the Humane Society of the U.S. and Mercy for Animals, Smithfield and some other companies have agreed to phase out these torture devices over several years to come. But Smithfield has already postponed their self-imposed deadline 0f 2017, and the growing number of ag-gag bills will be trying to stop humane organizations and whistleblowers from bringing to daylight the horrendous abuses of these facilities. In the final analysis, whatever may be done to give the pigs a few more inches of space, or to stop sadistic, stressed-out factory workers from beating, kicking and body slamming the pigs who are at their mercy, it looks like one thing will never change: The business of humankind is humankind. And it's not kind. We care little for anything and anyone but ourselves. The Chinese want more meat; Americans want cheaper meat; and the business community wants cheap profits. And to hell with the pigs.